Blog by the Journal "Public Administration Review"
A new blog "Corruption: A Bully Pulpit Symposium" by the Journal "Public Administration Review" has published 24 short contributions, each one delivering a novel idea on how to fight corruption (or criticising the standard methods). Please approach the website for unlimited access. Prof. Graf Lambsdorff contributed ideas on "Fighting Corruption with Insights from Behavioral Science". All blogs are happy to receive comments! From October 7 to October 14, 2018 the University of Passau offers the workshop "The Economics of Corruption 2018: Choice Architecture for Public Offices ". The event is targeted towards PhD and master-students with an interest in experimental and behavioral approaches to corruption and reform. More details are available here. Susanna Grundmann and Johann Graf Lambsdorff detect the corrupting power of income in a 2017 publication in the Journal of Economic Psychology titled "How income and tax rates provoke cheating – An experimental investigation of tax morale". They show that morale decreases with income but not with the tax range. Thus, higher taxes can compensate for the dismal distributional effect arising from rich people cheating more. Watch our Youtube-Video on the study. Governments, companies and organizations across the world have implemented strategies for countering corruption. A growing body of so-called best practice has emerged in the last 20 years. But some approaches have been criticized for being costly, ineffective or even counterproductive. This study illustrates this, using six examples, relating to the four-eyes principle, procurement, development aid, compliance statements, leniency and the tone at the top. Increasingly, behavioral science has provided insights on how to improve policies. These insights, along with experimental evidence, are applied to the six examples to provide direction to behaviorally better informed policies. Corruption has been a feature of public institutions for centuries yet only relatively recently has it been made the subject of sustained scientific analysis. 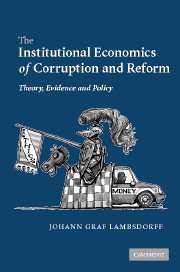 Lambsdorff shows how insights from institutional economics can be used to develop a better understanding of why corruption occurs and the best policies to combat it. He argues that rather than being deterred by penalties, corrupt actors are more influenced by other factors such as the opportunism of their criminal counterparts and the danger of acquiring a reputation of unreliabilty. This suggests a novel strategy for fighting corruption similar to the invisible hand that governs competitive markets. This strategy - the 'invisible foot' - shows that the unreliability of corrupt counterparts induces honesty and good governance even in the absence of good intentions. Combining theoretical research with state-of-the-art empirical investigations, this book will be an invaluable resource for researchers and policy-makers concerned with anti-corruption reform. Passau, July 2007. A chinese translation of the book is now available. 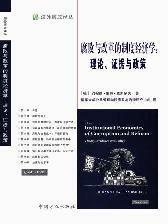 We would like to thank Guo Yong, Liu Guoxiang, Fan Xiaoyan and Qiao Jiying for translating and proofreading the book. Thanks are also due to Cai Wei, Cheng Wenhao and the Anti-Corruption & Governance Research Center, School of Public Policy & Management, Tsinghua University. impressum Innstr.27 - 94032 Passau - Germany - Fax: +49(0)851-509-2492 - last change 2018/11/21, 10:23.